Two years ago, Google started to test an analytics service for blogs. MeasureMap, the service acquired by Google to improve the interface of Google Analytics, was still available and MeasureMap users were invited to convert their accounts to Google Analytics. 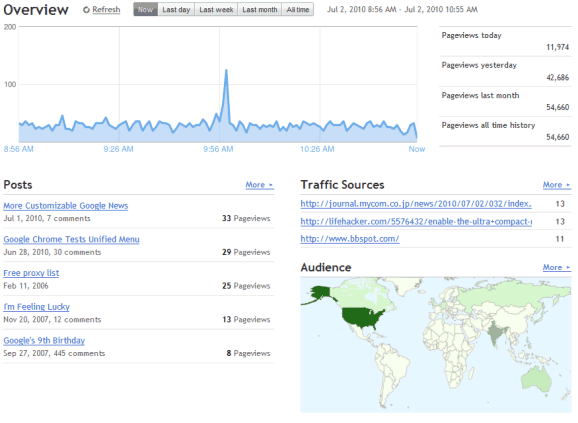 At that time, Google Analytics experimented with integrating MeasureMap features like showing information about comments, blog posts, links from other sites. For Blogger blogs, Google also added a "stats" tab on the dashboard. It's not clear if the Google Analytics experiment is still available, but Google released Blogger Stats, a Blogger feature that lets you see real-time data about a blog: the most popular posts, the number of pageviews for each post, the total number of pageviews, a list of traffic sources and search keywords, a breakdown of pageviews by country, browser and operating system. Blogger Stats is only available if you use Blogger in Draft, a playground where Blogger tests many new features. "The coolest thing about the new Blogger Stats is that it monitors and analyzes your visitor traffic in near-real-time. You can see which posts are getting the most visits and which sites are sending traffic to your blog right now," says Google. Blogger Stats doesn't use Google Analytics, which offers more complex reports, but they are updated every hour and sometimes even less often. This feature will speed up all blogs on blogger doe to less code of visitor trekking. I was using ststcounter code to track visitor nor it not necessary so i will remove it. "but they are updated every hour and sometimes even less often". You mean more often? Looks interesting, but it will need to be more accurate. Right now Blogger Stats looks like it's inflating my incoming Internet Explorer visits and page views by a factor of 10. Right now Blogger Stats looks like it's inflating my incoming Internet Explorer visits and page views by a factor! Totals by year for end of year round-ups (Top Tens) for the Year. I can't find an option to not count your own visits like Wordpress has. If I click on a link to one of my pages from within page edits (view page) or stats, that page opens in a new window and is NOT tracked. From that point, if I click on a link within my page in this new window, that pageview IS tracked. I find this behavior unexpected. I have problems too with the option to not count my own views. I will check out this page to see if there will be any news. Thanks for the article and for the screenshots, I found them helpfull. It would be cool if you can see more detail like cities, town, and time each post was seen! I agree with some others. I think it would be great if it did not count YOU as a view. I had to save my edit page to my faves and now backspace if I want to see the blog. Then it seems to not count me. And for those of us in larger countries, state views could be valuable. Then you at least know its not you being counted when the view count goes up. And you can see how diverse your audience is. If its your whole country, it could be the same person looking many times. But if several states show hits, you get a much better idea of the actual number that your stats show. Hey, i have a question. 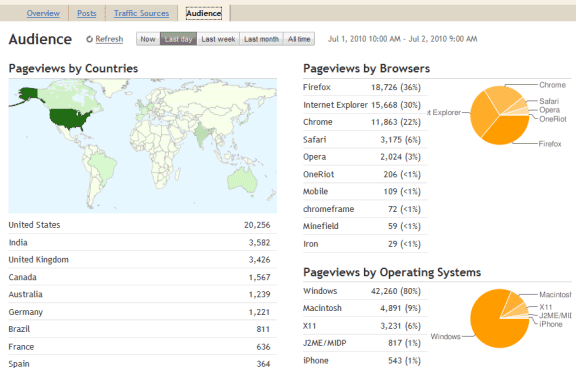 My blog is in air from december 2009 and in blogger stats in all time it's from may 2010. Can i change it? Is it possible somehow to reset the statistics? why my blog low rank in SERP?